Goodreads: One step forward. Two steps back. The Tufts scholarship that put Nora Stuart on the path to becoming a Boston medical specialist was a step forward. Being hit by a car and then overhearing her boyfriend hit on another doctor when she thought she was dying? Two major steps back. Kritters Thoughts: Nora Stuart was a good character, I enjoyed her, but for me the story was just a little all over the place. I love Kristan Higgins stand alone books, so when I was pitched this book to read, I didn't even have to read the synopsis, I knew I was going to read it and was pretty sure I was going to love it. And yes, I didn't love the plot, but I was at least along the ride with a good character. For me, the plot went all over the place. It almost felt like she was trying to include way too many things. There was back and forth in time and drama all over the place and it was over the top drama, so I just couldn't get into it and enjoy the ride. 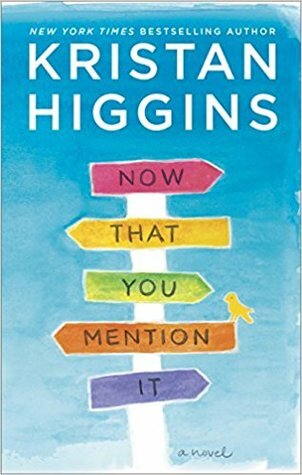 I am huge fan of Kristan Higgins, so although this book won't be in my top five of hers, not loving this book won't keep me from reading her over and over again! Disclosure of Material Connection: I received one copy of this book free of charge from Harlequin. I was not required to write a positive review in exchange for receipt of the book; rather, the opinions expressed in this review are my own. This is a romance novel for people who want a little something extra with their boy-meets-girl story. The main characters are complex and engrossing. The supporting characters are fully developed and add to the story. I love the Maine island location and hope to read more about the town. I especially loved Nora's dinner parties - what a hoot! I laughed so hard my co-worker is borrowing the book now that I am done with it. Thanks for an entertaining read!